Because common wisdom has told you to get the best tool for the job, you built your workflows around a slew of disparate simulation tools. Data exchange is a drag, and multidisciplinary collaboration an aspiration. Tools with specialized algorithms help data exchange along. Collaboration remains a goal. There are two complicating factors. One, while your decade-old process chugs along, clients want delivery last week. Two, product complexity today is a Mahler-like symphony of a thousand components — electrical and mechanical controls, embedded apps, sensors and assorted doodads — and you don't have a conductor. 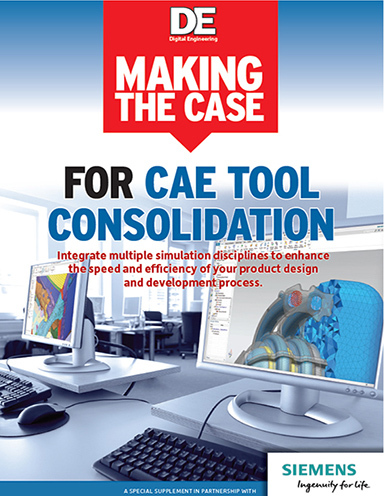 “Making the Case for CAE Tool Consolidation,” produced by DE editors in collaboration with Siemens, argues that a “consolidated approach that provides a streamlined multi-discipline environment that is still open and flexible is needed to address the challenges of modern product design and development.” It cites such benefits as a reduced number of tools, decreased licensing costs, easier model reuse across disciplines, better collaboration and faster iterations. Does it convince? Yes. This paper explains what's in Siemens' Simcenter 3D CAE environment for you. The dime tour is that Simcenter 3D is a scalable, open integration CAE solution. It enables a unified, shared platform across simulation disciplines. It integrates with your CAE and CAD choices. It can help make workflows more productive and results more consistent. Since it's available as a stand-alone solution as well as a platform geared to the Siemens CAD/CAE offerings, you don't switch out your third-party CAD or CAE solvers.